April 20, 2018, 9:34 AM · With each passing year my husband and I - both in our 60’s - find it harder to think of Christmas gifts to buy each other; we do our best to be both stealthy and surprising. However, the holiday season of 2009 was a difficult one for me as my mother had just died after a long, heart wrenching decline into dementia preceded by the devastating death of my beloved younger brother from brain cancer. The nature of their illnesses made them blessedly unenlightened of what was happening to them as I stood by, painfully aware that I was about to lose what was left of my family. My husband is not very good at being cagey and I can usually guess what he bought me well before the holiday, but this time I was stumped. Christmas morning finally arrived and excitement filled the house as I played Santa, handing out gifts from under the tree. All but one, that is. Rich retrieved a big box from the bedroom and everyone awaited my reaction as I opened the box. It was a violin! A violin? I was stunned. I knew they were expecting tears but all I could do was stare at it in disbelief. My mind raced; I hadn’t played the violin in over 50 years, so what was I going to do with this thing? What was Rich thinking? And, what was I thinking? It brought me right back to my childhood days, particularly after moving to a new town during 5th grade. My new elementary school offered music lessons and – having always been fascinated by the violin – I began immediately. Each week Mr. Minetto would come to our house and attempt to teach me simple tunes like Twinkle, Twinkle Little Star, Jingle Bells and Au Claire de Lune on my rented instrument. I enjoyed our lessons and would always associate the chalky smell of the rosin to those pleasant times. “Do you like it?” my son asked, eagerly. Now, I’m not normally speechless but today I was. All I could say was, “Yeah, sure.” I doubt that’s the reaction they were going for, but it was all I honestly had. My husband soon offered his rationale for buying the violin. “You always worry about what you are going to do with your time when you retire; you said you played the violin as a kid and that you enjoyed it, so I thought you could take it up again as a hobby.” All I could think about was the cost of violin lessons after a 50-year absence from playing. Not wanting to appear ungrateful, I hid my apprehension from Rich and the family. What he also didn’t know was the profound connection his gift was to my past; what I didn’t know was the part it would play in my future. But first the past…. Beginning in 5th grade, much of my free time was spent alone, reading or playing the violin, neither of which did much to combat my established image as the Official Eye-Glass Wearing Nerd of the family. The enthralling music of plays like My Fair Lady and Camelot and movies like A Summer Place truly made me happy and I spent hours and hours trying to replicate them. The classical music that played in the background of cartoons I watched or the weekly Million Dollar Movie mesmerized me. I had never heard of Mozart, Strauss, Beethoven or Bach but knew I loved the music. I began to use the violin as an excuse to isolate myself in an upstairs spare room, turning it into a world of my own. It became my obsession as I would play the same song over and over imagining myself sweeping the floor in a princess dress while waltzing to the story the music was telling. Blissfully alone, the music took me into a much happier world. I spent hours in that room, tuned out to the family melodramas taking place on the other side of the door. From beginning to end, my parent’s 27-year marriage was like a bad soap opera; they were two people who acted like volatile cohorts in a crazy drama that had no place to go but down, and neither seemed to mind if they took their children down with them. Mom was absorbed in the drama between herself and my father, who reveled in finding new ways to make everyone as miserable as he. Their relationship alternated between lengthy periods of vicious fights and icy silence. Dad was an angry, jealous man who was masterful at finding devious ways to constantly manipulate my mother. One day, after preparing to attend a wedding, Mom came downstairs looking amazing in a black cocktail dress with her jet-black hair pulled back into a tight bun. The rouge and lipstick she wore transformed her from ordinary to positively stunning. My father was also dressed for the wedding, but once he saw my mother, he became agitated while pacing back and forth and sighing heavily. My mother flitted around with last minute details and when it came time to leave, Dad was nowhere to be found. She called out for him in the house, but got no response. As she went from room to room calling for him, her panic increased. My younger brother and I looked at each other with an unspoken sense of dread between us. Mom finally asked one of us to look for him in the one place she hadn’t: the cellar. Her panic now spread to us as the cellar was a favorite venue for the psychological war games Dad loved to play. We stalled and stalled until Mom went downstairs to the cellar herself. There she found my father lying prone and feigning unconsciousness on a piece of linoleum, carefully positioned so he wouldn’t dirty his suit. Fooling no one, the fireworks ensued; they missed the wedding - which was his goal - and three weeks of tense, cold silence filled the house. My father was not above physical violence either, taking his frustrations out not only on his family but co-workers, as well. He was very open about his hatred and openly shared his stories of revenge. Mom suffered severe depression and had to be hospitalized. I can still see her fighting with the orderlies, grabbing wildly for the railing as they tried to take her for shock treatments. Not to be outdone, Dad had a nervous breakdown, spending several weeks in a state psychiatric hospital after his efforts to harm a co-worker failed. My parents’ toxic relationship impacted us all; my brother had anxiety attacks and - although I didn’t realize it – I too was very depressed. More often than not, I would come home from school, immediately dropping my books to the floor in order to lay across the three chairs lining the kitchen wall, falling into a deep sleep while still wearing my coat. However, I still had my violin. By the time I got to junior high school I had learned the basics of reading music and joined the school orchestra. While music alone had been an escape, I found playing in the orchestra to be sheer joy. I practically had to be pried out of the music room after each practice. I may have not realized it at the time, but the orchestra was teaching me much more than how to play music. Survival at home may have hinged on the maxim “every man for himself,” but in the orchestra I felt part of something larger. We all had to do our part in order to properly harmonize. We were taught that patience was a group virtue, and when the conductor’s focus was on the horns, the rest of us sat quietly until our time would come. We were made aware of how important each section was to the entire group. At home, our mistakes were met with fury or stony silence. My father once threw a knife at me for not putting mustard on his sandwich; in orchestra, mistakes were learning opportunities! Everyone made mistakes in orchestra, but no one minded - especially our teacher - a warm and even-tempered man aptly named Mr. Nicely. He was my father’s polar opposite and never minded our questions and turned our frustrations into reasons for a good laugh. In the end, as the instruments all worked together doing their part, the music flowed. I had been a shy kid who never “fit in” anywhere but now I felt like an important part of a group that worked together to create something beautiful. The school held concerts and I remember my mother attending one, but my father never came. The applause that followed our performances made me very uncomfortable as expressions of appreciation were not something I was used to. Life at home was getting more difficult. I felt powerless over my situation as my emotions fluctuated between depression and anger. I began to challenge my father and my rebellion spilled accordingly into the classroom. As a result, I was forced to go to a different school, one which – unfortunately - did not have a music program. The violin suddenly vanished from my life. Shortly after I changed schools, my parent’s marriage reached its inevitable ugly conclusion. With nothing more than our clothes, my mother, brother and I went to live in my grandparents’ attic, all sleeping together in a double bed and using a bucket for a toilet. Just about everything that meant something to us was ripped away. To make matters worse, my Mother capitulated to my father and sold him our home for $1. We were dead broke. My mother struggled to get on her feet, eventually getting a job and moving us into an apartment. My father lived alone in the house he so coveted and died of a massive heart attack 10 years later. The following year I finished high school and married the very next. My son was born two years later but, by the time he was two years old, I too was divorced and struggling on my own. My ex-husband was a deadbeat-dad, forcing us to go on welfare. Still, I was determined to build a better life for my son. A friend suggested I go to college, a goal that seemed well beyond my reach. Fortunately, this was a time when a college education was affordable with grants, scholarships and reasonably priced loans available. With guidance from my friend, I applied. There was no daycare in those days but a helpful neighbor watched my son and I was able to attend school while working several part-time jobs to get by. Four years later, I became the only member of my family to graduate from college. While being a single working parent was very difficult, life improved…very slowly, but very surely. Our future became less and less uncertain. My goal of giving my son a better life seemed within sight when I bought a small house to make him a “home.” And so it went until - after 22 years of being single - I met and married Rich, the love of my life. We were happy. When my mother died, we decided to move from NJ to the panhandle of Florida to be closer to my now grown son and his family. Within days of moving in, I felt like a fish out of water as the culture shock of living in the “Deep South” kicked in. The area was a very tight knit military community where non-military people struggled to fit in. The very active social life we once enjoyed came to a screeching halt. I felt lonelier with each passing day. Enter the violin. For months I had carefully avoided the violin Rich gave me. I moved it from room to room wondering what I was going to do with it. I was certain I was too old to learn to play again but felt guilty every time I walked by that case. Playing the violin isn’t exactly the same as riding a bicycle after a 50 year absence. I finally realized my only choices were to get lessons or sell the violin. Rich had been my “rock” as I grieved over the deaths of my beloved brother and mother who, in the end, no longer knew who I was. I felt selling his gift simply wasn’t an option. As my search for instructor began, I quickly learned the Florida panhandle is “fiddle” country, not violin. I wasn’t having much luck until I learned of a woman who had recently started a beginner’s group for adults. It was a perfect fit. My anxiety about playing in her small group eased when I learned that some in the group had never even played before! Allison and her colleague, Nester, made the class fun and the group immediately became the highlight of my week. Nester, a bass player, insisted I shorten my long, manicured nails in order to play. I resisted, only filing them a little bit each week. But when time for class came around, Nester would always say, “Shorter! They must be “shorter!” I eventually gave in. At 63, I was the oldest member of the group. My fingers didn’t move as well as they used to, my eyes didn’t always see the same note that was written on the page and staying focused was a challenge. Even though we all struggled - some more than others - we kept coming back. We laughed at our mistakes….but never at each other. I practiced almost daily, ensconced in our small computer room no longer to escape but to embrace a new beginning. We held a few mini-concerts for family and friends at Allison’s home, playing simple but elegant, music. Even though I’d break out into a cold sweat every time I had to play in front of people, I was still having a blast. But our life was about to change yet again. My semi-retired husband became increasingly bored and stumbled across a job on the Treasure Coast of Florida that piqued his curiosity. He applied for it never thinking he would be hired because of his age and the fact that it was 8 hours away. In fact, he couldn’t have been more wrong! The company wasted no time in hiring him and away we went. Once settled in, I began the hunt for another strings group and new teacher. In short, I could find neither. I was beginning to think my relationship with the violin was about to end for a second and final time. However, a friend put me in touch with a gentleman named Tom, a man who founded a local chamber orchestra. The skills needed to play in the chamber orchestra – which was also the only group around - were far above my ability and the thought of playing the works of masters like Mozart, Beethoven and Bach was overwhelming. Obviously, my commitment to playing would have to deepen. I began lessons with Tom with the goal of one day playing in his orchestra. Tom let me know he was up to the task providing I was too. A former Naval Commander, Tom was not inclined to work with somebody who was not interested in working. And so, the next phase of my relationship with the violin began. It was difficult, and I placed great pressure on myself in trying to improve at a pace that simply wasn’t realistic. I marveled at professional violinists who played their instrument with such ease it seemed they were born with it in hand. While I was being my own worst enemy, Tom remained steadfast in his confidence that I would improve. He had a myriad of tips and techniques to help me develop my skills and knew more about music than I could ever hope to know. The more he shared, the more I wanted to stick with it. Eighteen months later, I was stunned when Tom handed me the rehearsal schedule and told me I was ready to play at least one piece at the group’s next concert. Determined not to make a fool of myself, I practiced like mad. When the first rehearsal came I could barely contain my nerves. The minute I stepped into the rehearsal room I could feel the excitement. Music cases were strewn about as people scurried to set up chairs and music stands. The room was alive with people of all ages and I instantly felt 13 years old again. I was in heaven! My excitement on concert day was almost unbearable and I played like my life depended on it. When it was over I practically floated off the stage to kiss my beaming husband. A door long closed in my youth has reopened and my obsession of the past is now a deeply satisfying hobby. I now play with ease the waltzes I loved as a child and feel I am part of the music instead of just an admiring bystander. Not only do I now know who Mozart was but was thrilled to get to visit his home in Saltzburg, Austria a country where it seems everyone plays an instrument and whose history is steeped in music. Through the violin I have met other “late bloomers” like me and others who have continued to play an instrument well into their 80’s! Since then, I have grown as a player and have come to realize the violin taught me far more than how to read music or use a bow. Mr. Nicely showed me that not all men were like my father. He never made me fearful to ask questions or make a mistake. And, when he made a mistake, he made fun of himself and made us laugh. When my father made a mistake the slightest hint of a giggle would be met with an icy glare. In orchestra I learned that only way to make something work is by working together, not against one other. The end result was music beautiful enough to make one cry or spirited enough to make one break into dance. At home no one really listened to each other; but in orchestra, listening to others was just as important as knowing your part. Joining orchestra required a commitment to practice and provided me with the structure my chaotic home life lacked as a child. The beauty of the music we produced together taught me the power of “we” over the selfishness of “I.” As a youth, I was ridiculed at home, but in orchestra it was my contribution as a player that mattered, not my looks or interests. For seniors like me, reconnecting with the instrument of one’s youth is a bit like being reborn. Also, there’s something oddly comforting about playing music that has lasted hundreds of years. From a practical standpoint, learning to play and read music sharpens one’s cognitive skills and the ability to focus. Most of all, it provides an immensely satisfying pastime. My story proves school music programs provide more than just an easy class. When municipalities cut such programs from schools - it leaves children who don’t like or aren’t good at sports with fewer opportunities to learn valuable life lessons. The principles of persistence, practice, patience, humor, acceptance and - most importantly - teamwork endured and have served me well. Without knowing it, the experience in orchestra made me realize that there was another way of life. I believe it can do that for others as well. April 20, 2018 at 08:07 PM · That was wonderful! I thought I had a difficult childhood, but it was nothing compared to yours. I am so glad that you survived your childhood and I can appreciate the enormous help your violin was. I admire you for going to college and earning your degree under difficult circumstances. You and I are about the same age, and I was a grad student In biochemistry when you were an undergrad. I had students who were single Moms like you. I admired their commitment and determination. I used to let them bring their little ones into the lab (against the rules) while I tutored them. Kudos to you for earning your degree that way at that time. That was back when we were fighting for equal opportunities for women. I'm also so glad that you returned to playing the violin and fell under its spell again. I especially enjoy your story because I teach violin to beginners, both kids and adults. As far as I know, none of my students has had such a hard time as you, but I hope that I have helped them to love life and themselves better. April 20, 2018 at 08:45 PM · Thank you for your kind words. I assure you....you have helped them more than you know. April 20, 2018 at 10:12 PM · Thank you for sharing your story. far in such a short time and wouldn’t think of putting it down again. April 20, 2018 at 10:15 PM · This is a moving story. Thank you so very much for sharing your experience. What a wonderful outcome for you all around. April 20, 2018 at 10:49 PM · Thank you for sharing your lovely, moving story. I too learnt as a child, not in the same circumstances though. After over 20 years away from it, I started to play again. It’s now my passion, I get such joy from playing and have met so many lovely people through it. I was lucky enough to have free lessons at school, I’m sure if my parents would have had to pay I probably would never have learned. Now living in an Australian rural area, the emphasis is very much on sport, as you say the children miss out, and the community. April 21, 2018 at 06:46 PM · Mrs Jones: Thanks for articulating what many people, including myself, have struggled to say. My family was far from the Waltons (Much closer to the Osbornes) and the violin was such an important coping tool for me to have. Some of the first people who truly cared and were interested in me as a person were violinists. I've never quit playing for any extended period of time, I still find I need what my violin does for me. Thanks for sharing your story. April 21, 2018 at 08:09 PM · Thank you as well. I struggled with the decision whether to make this story public or just share it with close friends due to it's personal nature. These comments have made me comfortable with my decision. Thank you all. April 22, 2018 at 12:25 AM · What a gift you have, to tell us the truth and bring other people to tell us theirs. I feel music saved my life. In spite of the superficial competition and the chronic insecurities, it still has the power to make us complete. This forum that Laurie provides a safe haven for our views about music and ourselves. April 22, 2018 at 01:38 PM · Thank you for this. As one who has played, more or less coninuously for 55 of my 63 years, I appreciate even more your experience--and want to thank you for the light you shed on mine. April 22, 2018 at 04:05 PM · Thank you. I hadn't thought about how long time players might view this. I appreciate your perspective. April 22, 2018 at 08:59 PM · While I felt sad at the misery you experienced in your young life, I knew what you meant about playing in an orchestra and having music as a source of comfort. Your story is a wonderful and uplifting piece about music and about returning to it late in life! April 26, 2018 at 09:55 AM · I can very much relate to that story. I, too, resurrected my violin playing after a 30 year hiatus. I’m 62 years old. 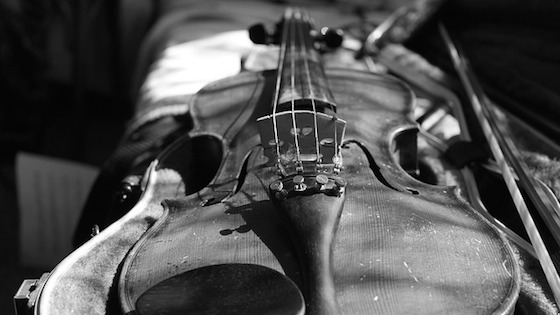 Violin is my “therapy,” and has filled a void in my life. Thanks for sharing!